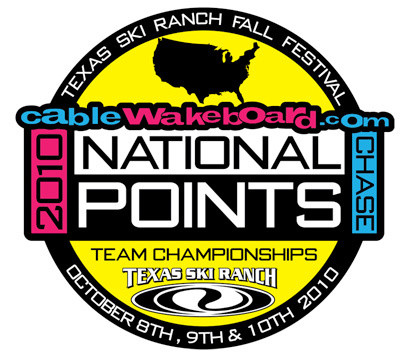 2010 CableWakeboard.com Points Championships Looking for Partners! Between June 15 and July 15 eight different cable parks across the United States have been and will be hosting a five event weekly series to qualify a team to compete at CableWakeboard.com National Points Championships held at Texas Ski Ranch on October 8, 9 & 10. Riders must qualify as the top three in one of six divisions at their home park to guarantee themselves a spot in the final event. The different divisions include: Beginner, Intermediate, Advanced and Pro Wakeboard, Wakeskate and Wakeski. Wakeski was added this year and will be scored as an individual event but not counted in the team standings for 2010. So far after three events, TSR is averaging over 52 riders during their Thursday night events. The response has been overwhelming and is being embraced by the local media as well, commanding major coverage in every Saturday Sports page following each event. TSR is looking for partners for the Inaugural Championship event. If you are interested in partnering with both Texas Ski Ranch and Cablewakeboard.com please respond to this email and we would be happy to contact you to discuss the different levels that are available to come on board. Partners already associated with the event are MasterCraft, Liquid Force Nike 6.0 and Pro-Tec. We are looking for product, support and dollars that will go 100% directly towards the event itself: prize money, marketing, operations and the banquet planned for Friday night. Thank you for your consideration of this industry changing event that could shape our industry for years to come as cable parks continue to grow. This is an excellent opportunity to get in at the ground level that could both improve the level of riding in the U.S. and help increase participation nationwide in the sport we love.